What's The Difference Between Eastern & Western Style Massages? There is no debating that a good massage is great therapy. It helps increase blood flow, relieve stress and heal injuries. These benefits apply to massages of all types, but to get the most out of your next massage, you may want to learn a little more about your options. To start, there are two very different types of massage that follow very different principles. Eastern and Western massage are both effective, but they may have different purposes. The Eastern style of massage is all about balancing energy meridians within the body. Instead of targeting one issue that the recipient may be facing, such as a sore back, Eastern massage attempts to heal the root cause of the issue and promote overall health and wellness. The first difference you may notice with Eastern massage, if you are accustomed to Western techniques is that there is usually a longer period of discovery. In any massage, the practitioner will likely ask where you are experiencing pain or discomfort. But with Eastern massage, the therapist will perform his or her own discovery mission by checking pulse points in your wrist and evaluating your tongue. The next difference you will notice is that Eastern techniques can be more rigorous than Western. By striking, rolling and applying pressure to various pressure points, the therapist will attempt to address the cause of your pain, discomfort or other issue. 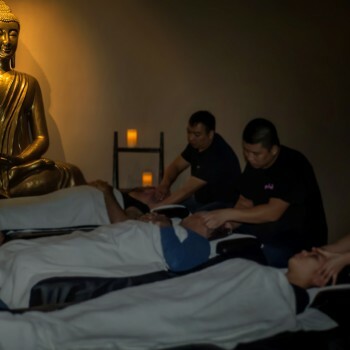 If you seek treatment through Eastern massage, the therapist may suggest adding Yoga or Tai Chi to help relax and invigorate the mind and body. Both are known to help reduce stress and when combined with massage, they may have other benefits. A 2010 Complimentary Therapies in Clinical Practice study found that yoga and Tai Chi combined with massage may promote relaxation, reduce stress and possibly even increase the speed and accuracy of performing math problems. Types of Eastern massage include shiatsu, Ayervedic, Thai and Balinese. Western massage works by targeting various points in the body to address issues, loosen muscles and promote overall relaxation and healing. It is more about treating the muscles and connective tissue than it is about focusing on overall wellness, but it is effective at promoting relaxation, soothing sore muscles and helping to improve circulation. Much like with Eastern massage, there is more than one type of Western massage. You probably recognize the ever-popular Swedish massage as it is found on the menu of almost every spa in the United States. The Swedish massage is so popular because it appeals to the masses with medium-intensity pressure and positive results. Because this type of massage is so popular, its effects have been studied at great length. Research published in the Journal of Alternative and Complementary Medicine found that not only does it promote relaxation and reduce anxiety, but it may also be an effective treatment to help manage inflammatory and autoimmune diseases. Other types of Western massage include deep tissue, soft tissue, myofascial release and trigger point therapy. Don’t let the array of options confuse you. There are no wrong choices to be made here. If you are confused about which type of massage to choose, talk to your massage therapist about your needs and expectations. You may find that a combination of techniques is what is best for you.